The first images of a holiday home for sick children being built by the family of Bradley Lowery have been released. Six-year-old Bradley died from a rare type of cancer in 2017, having been diagnosed when he was 18-months-old. The home is being built in Scarborough where Bradley and his family took one of their last holidays. 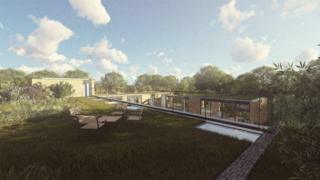 The images have been released by architects Building Design Northern after plans were lodged with Scarborough Council. Bradley's mother Gemma Lowery, from Blackhall Colliery, County Durham, previously said Scarborough was a "very special place" for the family. According to the Local Democracy Reporting Service, documents submitted in support of the plans state: "This important facility is conceived as a new holiday-home typology for families who have children with life-threatening, shortening or compromising medical conditions. "The house accommodates the extended family and friends of the sick child so that they can collectively have a luxury holiday in a state-of-the-art facility." The documents from BDN state funding for the home has come from a number of sources including Sunderland AFC, for whom Bradley was a mascot, and Premier League side Everton. The five-bedroom house is to be built on land that was formerly part of the Scalby Manor Estate which has been gifted to the charity by the council.